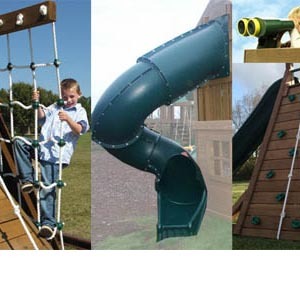 Creative Playthings have over 50 years experience in the play industry and are one of the biggest residential climbing frame manufacturers in America. 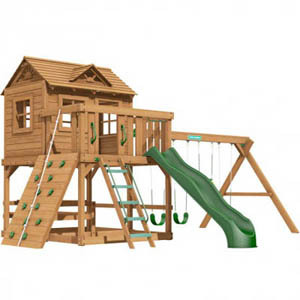 A choice of six wooden towers, of which you can then customise with a swing section, climbing wall or any of the many other exciting and innovative swing set accessories – the only limit is your imagination. 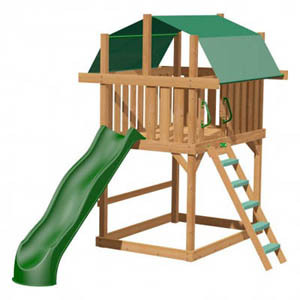 If requiring a wooden play set in a package, there are a number of different sets for you to choose from. With the exception of the Manchester (which has a 6ft high platform) all the towers have a 5ft high play platform. The difference between the sets being the size of the platform. 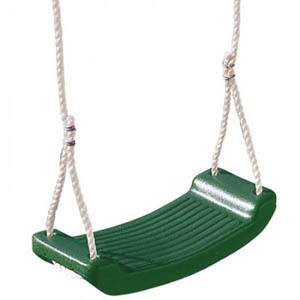 Manufactured from specially treated grade 1 Southern Yellow Pine grown in managed forests, and sanded and kiln-dried to ensure consistent high quality in every outdoor swing set. Beautifully finished with a brown stain and backed by Creative Playthings Limited lifetime Warranty. Southern yellow pine has the highest density of all structural timber species, providing superior fastener holding power and load bearing capacity…. Southern yellow pine is the best there is.